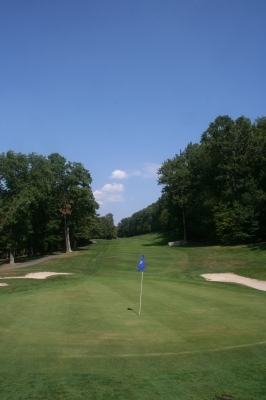 MCHENRY, MD � There�s one school of thought in golf architecture that emphasizes the �natural� state of the land when laying out the golf holes � in other words, leave it up to God�s good imagination and creation to dictate the shot values of the potential golf layout. That�s a nice thought if your piece of land is cooperative. But in a mountain setting, finding enough flat surfaces for a golf course can sometimes be very difficult, if not impossible. In that situation, you might need to do a little �creating� of your own. 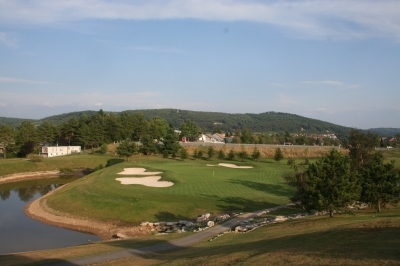 The par five 8th hole gives a good look into the terraced nature of Wisp Resort's golf course. Sometimes if you don't have flat ground, you've got to create it. That�s exactly the thinking at Wisp Resort, in Western Maryland. 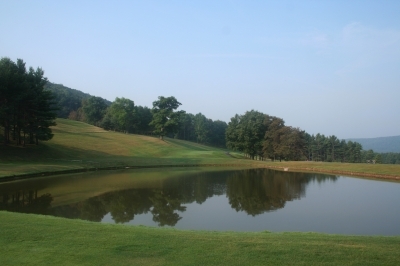 Wisp�s golf course was built in 1981 (designed by Pittsburgh based Dominick Palumbo & Associates), as a �warm season� activity to encourage visitation during the majority of the months where skiing isn�t offered higher up on the mountain. Unlike some other ski resorts with golf courses, Wisp�s is actually run out of the main ski lodge and rests within easy view of the ski runs themselves, so there�s certainly a tangible �winter� resort flavor to the golf as well. And perhaps the greatest distinguishing characteristic at Wisp is the terraced nature of some of the golf holes � which �created� the requisite space to allow for golf on a piece of land that would�ve been difficult to do so otherwise. A golf course in the mountains should have beautiful scenery. Wisp doesn't disappoint. Here, the par four 14th hole. Epp should be lauded for her honesty. The bottom-line is too often ignored when talking about �visions� for building something. The fact is, though Wisp is not exactly in the middle of nowhere, it�s not the closest alternative for mountain adventure, and people need a reason to drive about two hundred miles (from the Baltimore/Washington areas) to reach it. Most of the driving involved is on Interstate 70, then 68, so it�s not a bad drive. But Wisp�s not a place you�d go just because you decided to head west on a sunny afternoon. 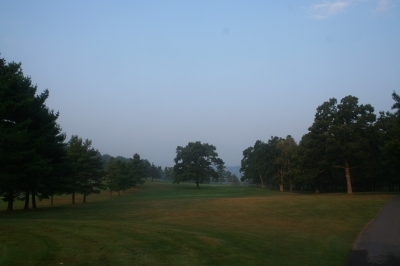 A golf course is another compelling reason for people to head to a part of Maryland better known for large expanses of wilderness than for human habitation. Luckily, the golf course (along with the other activities) makes the trip worth it. The resort bills it as a �mountain� course, though it doesn�t really play like one � there aren�t really a tremendous number of elevation changes, though the holes certainly do go up and down in spots. But mostly, Wisp is a pleasant resort course that won�t beat you up too bad, or let you down too easily. Nearly all the holes are tree-lined and some are very tight, but if you�re hitting sideways, usually you can still find your ball (after a good bouncing by the trees) and move along without too much delay. There's a stretch of holes on the front side that are as tight as you're going to see anywhere. Here, the par four 5th hole. Another nice feature is the absence of blind shots, which many mountain courses must include because of the nature of the land. At Wisp, you�ll see the areas you�re playing towards. Or, in the alternative, you can be WAY down the slope if you miss on the wrong side. There�s nothing quite like trying to play a ball back up the slope and over trees at the same time. This course will present some situations that you don�t see everyday � but it�s okay if you approach it with a sense of humor. The par five 17th hole is a roller-coaster ride from start to finish, and this fairway bunker marks the dogleg turn for home. The greens are small to medium in size, and the rough around them is trimmed to accommodate resort play. Our visit came at the end of a very hot and dry summer, so the fluffy stuff probably wasn�t as thick as it would be at more temperate times of the year. The greens had also just been aerated, so it�s hard to tell how the putting surfaces would roll at full speed. They�re also not overly undulated, so it provides for fair challenge. 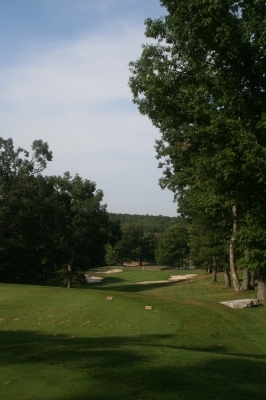 We played the course with a couple gentlemen from Pittsburgh who said they were frequent visitors to Wisp � and that the conditions were usually very good, and the price was right. What more could you ask for? 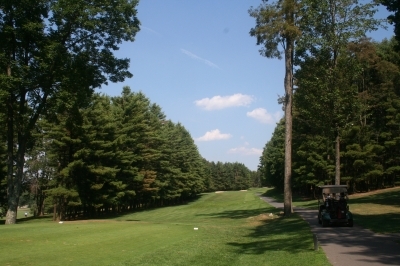 The most challenging aspects of the Wisp course were the trees, especially on a four-hole stretch on the front nine, starting with the fifth hole, a 434-yard par four. 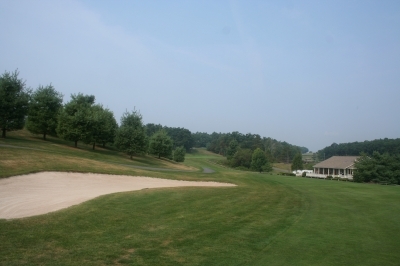 From the tee, you�re looking down a fairly narrow fairway with very little rough on either side, and dense woods bordering the playing area. 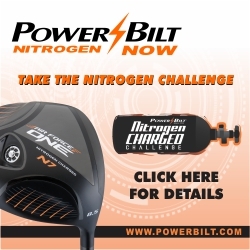 Here�s a hole where you could use a Tiger Woods-like �stinger� shot, hit it low and let it roll. But very few of us have that in our bags, so just swing away and hope for the best. This early morning shot shows one of Wisp's landmarks, a huge oak tree in the middle of the fairway on the par five 3rd hole. You can go over it, but it'll take a pretty good poke to do so. The 379-yard fifth hole is very similar, but actually plays uphill the latter half of the hole, making it one of the tougher golf holes around. If you�re in play off the tee, you�re okay, but anyone who�s a little crooked with a driver is in big trouble � especially since the hole slopes slightly right to left, so merely landing it in the fairway may still move it towards trouble. In addition to the plentiful trees, there are five water hazards placed throughout the course, including on the par four fourteenth hole, which has two of them (off the tee and then again on the approach). 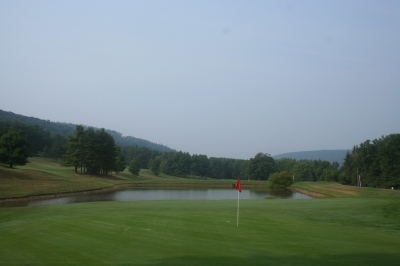 For those who haven�t been to Wisp in a few years, you�re probably going to notice some changes, most notably to the eighteenth hole, which was converted into a very attractive par three with big, bold bunkering more reminiscent of newer courses. You'll need to account for the trees on the par threes, too. Here, the downhill par three 13th hole. Epp says they�ve also removed trees and bunkers on holes six, nine, fifteen, sixteen and seventeen in the last five years, again in an attempt to keep things playable. For ladies, new tees have been added which reduces some of the carries over water. �These four new holes feature conserved wetland areas for natural flora and fauna as well,� Epp added. The 6th hole is tight, and the last half plays uphill. It's quite a test. 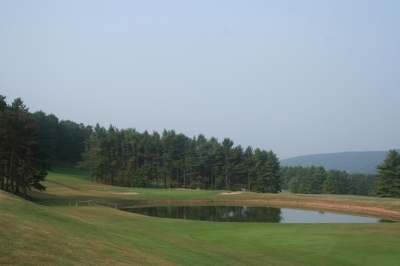 To sum up, Wisp Resort is not as flashy as some other Mid-Atlantic mountain resort golf experiences, doesn�t have a �name� designer, and won�t thrill you with dramatic drops, carries or once-in-a-lifetime difficulty. But it�s still a solid place to play golf and rates high in the value and �get away from it all� categories, especially when you factor in the wealth of other activities you�ll find up on the mountain. It�s the strange nature of a ski resort � but there�re probably more things to do at them in the warm season than during the winter� or at least you�ll have more choices. Despite the plentiful trees at Wisp, there are some open views as well. Here, looking towards the green on the par five 11th hole. 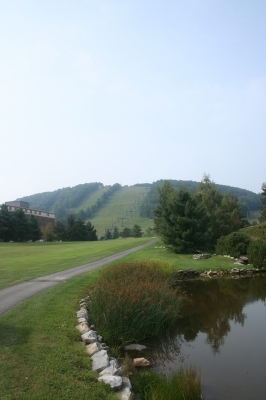 Outdoor activities abound at Wisp, including chairlift rides, disc golf, downhill and cross-country mountain biking, mountain boarding, a paintball course, a 20,000 square foot �Skate Park� for skateboarders, freestyle bike riders or rollerbladers. For those desiring the Spa experience, there�s the Sewickley Spa, which offers luxury services including facials and massage therapies. Wisp�s Nature Program and Bonfires are a good way for folks of all ages to learn about the mountain environment, and they�re also entertaining � with native flora and fauna along with history and stories of Western Maryland. The par three 18th hole was completely re-done. It's a beautiful way to end the round. For kids, there are Kids Camps � all inclusive programs offering day and overnight adventures for children with different weekly activities and agendas. Then there�s the �Kids Night Out� program, for kids seven and older. In addition to the resort�s activities, Wisp has partnered with Orivs Outfitters, which offers guided fly-fishing services, instruction and a retail store. Close-by to Wisp are additional activities serviced by Wisp�s preferred outdoor vendors which provide participants with guided rock climbing, whitewater rafting on the Youghigheny and Cheat rivers, waterskiing and wakeboarding on Deep Creek Lake, dogsled tours, and more. 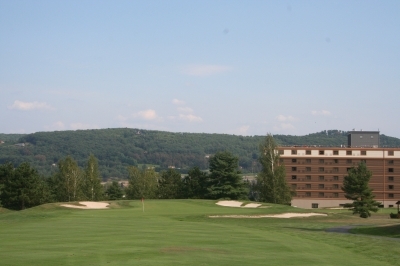 Golf and skiing go together at Wisp. Because of the golf course�s central location to the rest of the resort, you�re literally staying a driver�s shot away from the first tee � in the recently renovated Wisp Resort Hotel & Conference Center. The improvements included a new lobby design and layout, along with new furnishings, wall vinyl and carpet for the entire hotel. Sleeping quarters are quiet and comfortable, and during the summer season, a great value. There are 102 suites and 67 guest rooms at the Hotel. Visible in back of the 9th green is the Wisp Hotel & Conference Center -- definitely a nice 'indoor' place to stay for your summer vacation. On site dining includes DC�s Bar & Restaurant which offers casual dining with a wide variety of culinary selections. Note: Peak Season rates are higher in some cases. You can walk the course on weekdays. Consult the website for further rate information.